Mary grew up in Farmington Hills, Michigan and attended University of Pennsylvania for college where she first became interested in emergency medicine while serving as a clinical research assistant in the ED. 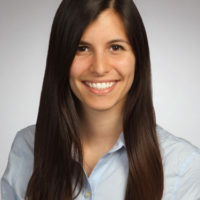 She completed medical school at Loyola University Stritch School of Medicine in Chicago, and is currently a chief resident at the University of Michigan/Saint Joseph Mercy Hospital EM residency. Her primary interests include medical education, social media, and leadership. She became involved in AAEM/RSA as a medical student while planning a popular regional Midwest Medical Student Symposium, was subsequently elected as a member of the RSA Board of Directors in her first year of residency, and currently serves on the board as the Immediate Past President. In 2017, she received the AAEM Resident of the Year Award. She has previously been heavily involved in planning the Resident Track and Chief Resident Symposium at the CORD Academic Assembly. She is an active member of the Academic Life in Emergency Medicine team, having created digital illustrations for the orthopedics Paucis Verbis cards, edited podcasts and created the Innovations in Didactics and Educational Activities (IDEA) series. She is also a member of the FemInEM team and an editor of the Speaker's Bureau. She created the residency blog at her program, WolverEM, and helps run the residency Twitter account. She appreciates the excellent mentorship she has had thus far and thoroughly enjoys mentoring other students and residents. She ultimately plans to pursue a medical education fellowship and obtain a masters in medical education. Mary's husband Nate is also an emergency physician in the same program and her co-chief.